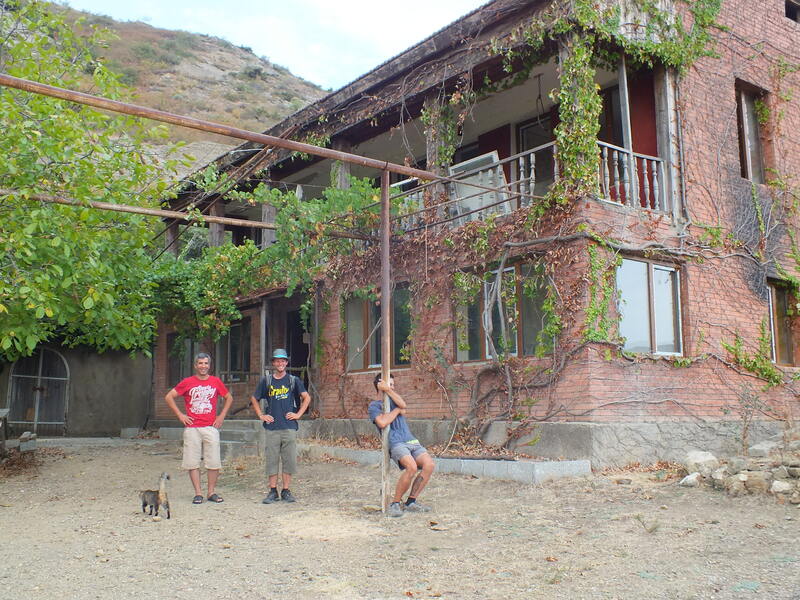 A very belated post from my time in The Travel House in Tbilisi, Georgia. As I write this my body aches, I’m almost dangerously dehydrated and I can barely keep my eyes open. Is this the result of a hard day cycling? No, my current state has been caused by hitch-hiking. 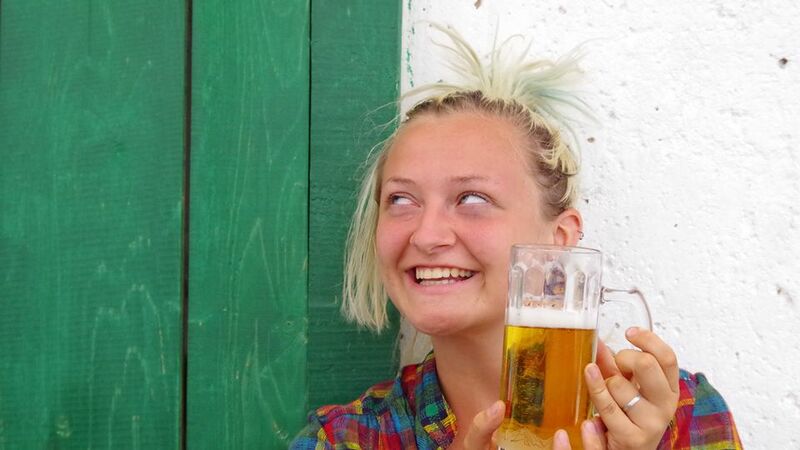 I have hitch-hiked once before on this trip, when my chain broke in France and I had to get to a town to buy new links. That was different though. I was travelling only about 10km on a single stretch of road not far from Paris. My recent hitch-hiking epic was from Tbilisi, the capital of Georgia, to David Gareja, a Georgian-Orthodox monastery cut out of the rock, about 85km outside the city. 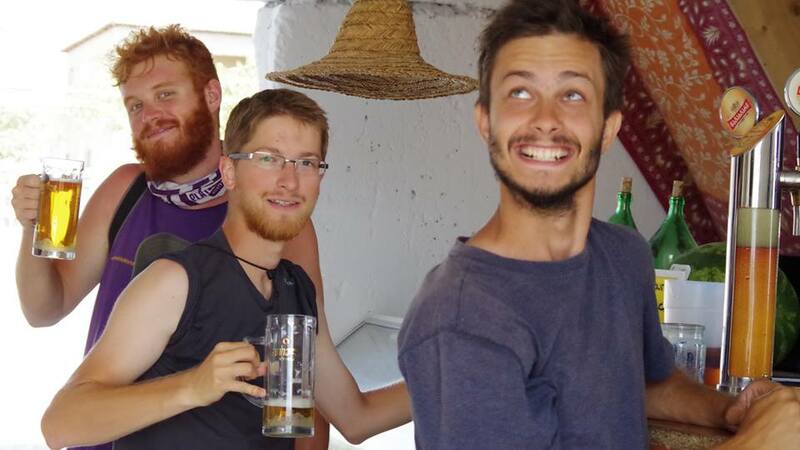 The plans were made on Friday night, over a few beers, and involved eight people from the Travel House, a Serbian-run open house for travellers. More on that later. Once we were out of the house the next morning our plans went into action. The eight of us would split into four teams and race to the monastery. The other seven are seasoned hitch-hikers, with their own codes and rules of acceptable hitch-hiking. Thankfully, my team mate, Katia, knew what she was doing, and could speak Russian. The four teams were quickly split as some were too slow at the subway barriers and others hung around to wait for them. We went on with another team and got a bus to the outskirts of town. Then the hitch-hiking began. It seems to be an accepted fact that girls get picked up faster than guys, so I was again lucky to be with Katia as we stuck out our thumbs and put on our biggest give-me-a-ride smiles. Despite our best smiles, however, the other team got picked up first, shooting away in a shiny silver ride and we were left in the dust, smiles still plastered to our faces. We were picked up by soon after but after just a few kilometers we were dropped off again. That was okay though, because the next car to pick us up was the car I had been hoping for. An ancient, rusty, black and white box of soviet history. A Zhiguli! It was stunning, the inside panels were missing from the doors and the windows were lowered with a handle passed to us from the glove-box. The steering column and dashboard were a marvelous tangle of coloured wires and the whole thing couldn’t go above 30kph. Now the huge smile on my face was genuine. The magic of the vehicle was made complete when we pulled into what looked like a car park. I was confused until I realised that we had stopped for gas. We all had to get out of the car and stand back as gas slowly filled the tank, and the inside of the car. We went in the Zhiguli until the turn-off for the monastery where we said goodbye and found two other teams, the ones we had left behind at the station. With one of them we crammed ourselves into another classic soviet automobile, a Lada. These can be seen everywhere in Georgia. When I’m cycling I play a fun game called ‘Lada!’. The rules are simple, you cycle normally, and when you see a Lada go past you shout ‘LADA!’. (Yes, I know, I spend too much time alone). In the Lada and then another van we made out way to Udabno, a town whose name literally means ‘desert’. And that’s exactly what we were in. All that was missing was some tumble weed rolling down the dusty road between the bar and the outhouse and the scene would have been complete. This is about the time that the cars stopped coming. Not ideal when you’re in the desert, 15km from where you want to be. In over an hour only three packed cars passed and the six of us were stuck. 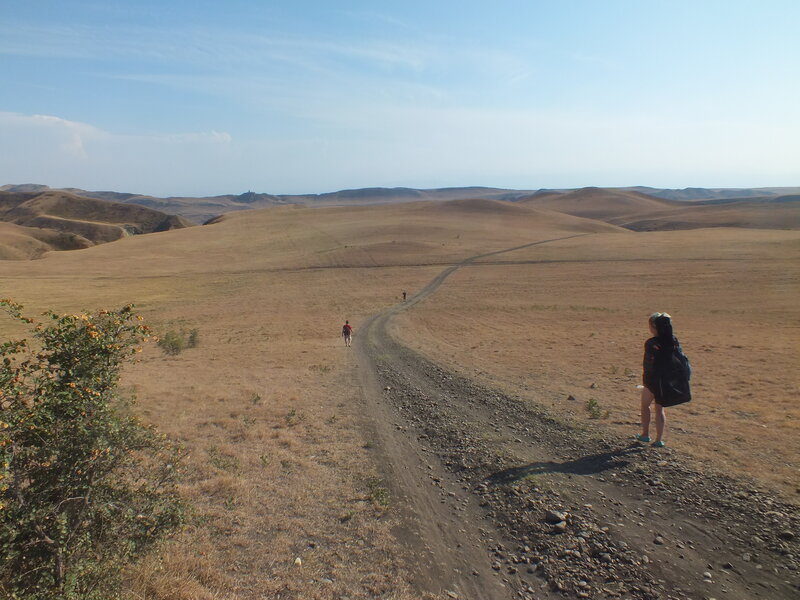 One team decided to start walking along the road, deeper into the vast emptiness. Another hour later, when no more cars had passed our way, the four of us that remained decided to start walking too. We had heard that if we left the relative safety of the road there was a short-cut through the desert. We decided to take it and left the road, following a track into the barren land beyond. Once we entered the beyond it seemed to get much, much hotter. Suddenly we were soaked in sweat as we crossed the Valley of the Dead. We had to keep our eyes peeled for snakes, which are famous in the region and which we’d been given numerous warnings about. Out of the valley we entered the Crack of Doom, a rocky gorge littered with huge boulders and cave homes high up in the cliffs. By this point we began to think about turning back. It was getting late, we had set off over seven hours ago and there was a chance that the other teams would leave before we got there. We got word that one team had arrived at 2pm, it was now past 6. But we walked on, along the Road of Bones (there were actual bones) and up and down the three Hellish Hills until we met the road once more. We were almost completely out of water and the monastery was nowhere in sight. It was almost another hour before we found it and in that time I had climbed to the top of a high ridge, hoping to get a better view and on the other side I could see the desert plains of Azerbaijan, my next destination. Finally, sunburnt, dehydrated and covered in dust and dirt, we made it to the monastery where the other teams were waiting. The first team had enjoyed an easy journey from Tbilisi, in only two cars, and they had been waiting over four hours. The second team arrived an hour before us and as I was in the hills and had to climb down, my team came in last. But I wasn’t worried about that, there were more pressing issues. We had arrived so late that all the tourists had left, meaning we had no way of getting back. Also, we didn’t have any food. We quickly accepted that there was little or no chance of us getting back that night. Not without trekking 50km across the desert at night, which wasn’t really an option. We were going to have to spend the night. Our growling stomachs helped us focus on the more immediate issue, food. Between the eight of us we had a peach and about six slices of bread. 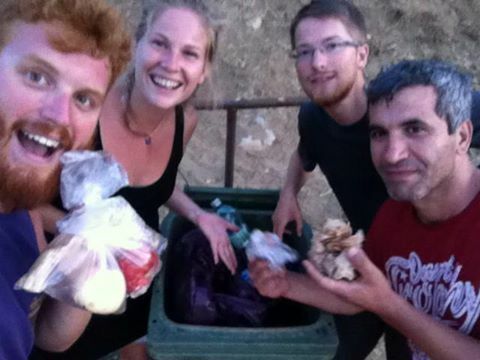 I decided to go hunting for food with Jacek, a professional juggler from Poland. The monastery was silent, completely deserted but for the odd black-robed monk. The small shop was closed and looked like it only sold candles and trinkets anyway. I was feeling more and more certain that we were going to starve as we reached the bin and the small car park. I stopped. Desperate times call for desperate measures. I took a few steps towards the large green bin and peered inside. It was mostly filled with empty bottles but two large, purple plastic bags caught my eyes. Jacek could hardly believe it when I reached in, opened one of the bags and began rooting around inside it. I had struck gold. Inside the purple bags were many smaller bags. It looked like each bag had once held an apple, some bread, a tomato, some cheese or meat and a yoghurt. Few now had all these things and lots the the bread had been eaten, but thankfully the owners of these lunch-packs had been fussy eaters and there was lots of food left. I was laughing at our luck and Jacek was laughing at me as we took our prize back to the group. When it was all shared out there was enough for everyone, even the vegetarians and the vegans of the group were happy, which never seems to happen. By the time we had finished it was dark and we needed to find a place to stay. We found someone who worked in the monastery and Egor, our Russian negotiator, spent a long time talking to the cheerless monks. They would allow the boys to stay on the grounds of the monastery, but the girls would have had to stay outside, with the snakes, scorpions and wolves. That’s religion for ya! In the end a geophysicist offered to let us stay in his nearby house/seismology station for the night. The house was large and distinctly spooky. The furniture was threadbare and faded and there weren’t any lights. Rather than split up we dragged our mattresses out onto the large balcony to sleep. It was only the next morning that we noticed the saws hanging from the broken light fittings above our beds. The next morning we decided that the best way to get back to civilisation was to once again trek across the desert to the town of Desert (Udabno). I don’t recommend walking across that kind of terrain at midday, without any breakfast, but eventually we made it to the shade of a Polish bar that has somehow found its way to this tiny patch of a village. We dropped into the shady seats, ordered a beer and were given some food. We had made it out alive, though Egor’s hysterical laughter at the sight of a cow on the road suggests that he was getting close to madness. We hitched a ride on an open truck with seventeen locals and then split up again. This time I went solo with five Georgian boys. Only once the door was shut and we started moving did I notice how young they were, then I was told that the seventeen year old driver isn’t even allowed a license for another year. I sent a prayer out to the hitch-hiking gods, asking for an extension on my beginners luck. 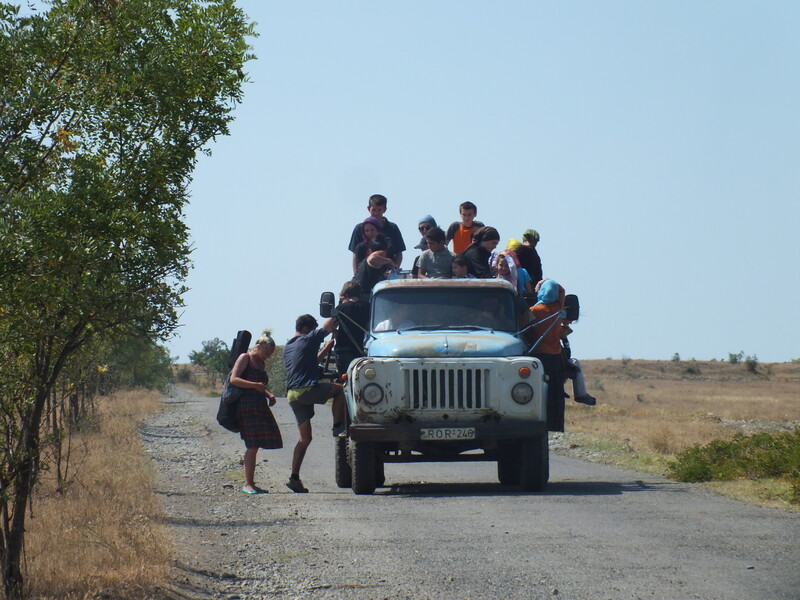 My final ride was in a taxi to Tbilisi, though I didn’t pay, and eventually, burnt to a stripy crisp, dehydrated and too tired to think, I got back to the Travel House. 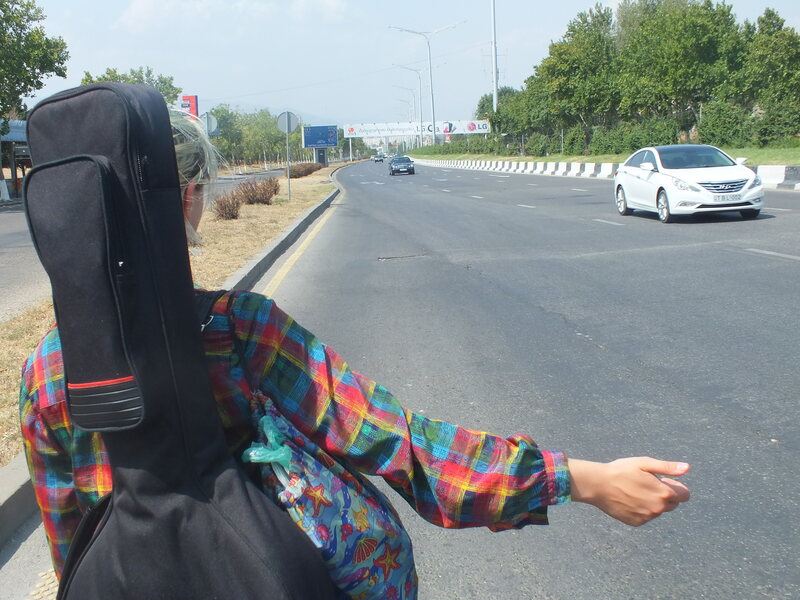 I crumpled into the sofa and thought about the pros and cons of hitch-hiking. I guess it’s one way to travel, but for now I think I’ll stick to cycling. The Russian negotiator and the Polish juggler – that made me laugh real loud! What happened to our water reservoir polyphony video? I can’t remember how we knew but we were aware that they had arrived long before we did. We were worried that they would leave before we arrived. How are you doing, hope you are doing well and good luck for your new adventures. This is Mohammed Noor by the way, we met in London. I’m doing well thanks, planning the next adventure. Remind me where we met, I’ve been back in London for a while.